Australian activist Mina Guli arrived in Egypt on Wednesday as part of her mission to go on 40 runs in 40 days along rivers in six countries to advocate for the providing of safe water for all. The 46-year-old Guli is a former corporate lawyer who quit her job in 2012 and established her water charity “Thirst” to raise awareness about water issues worldwide. Guli is running along Egypt's River Nile in support of the UN Global Goal Six, which calls for the providing of universal and equitable access to safe and affordable drinking water for everyone in the world by 2030. Guli has been on the her runs since World Water Day on 22 March, and has run the Colorado, Amazon, Australia's Murray Darling and China’s Yangtze rivers. 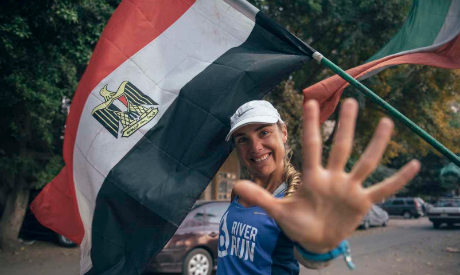 Since her arrival to Egypt, Guli has shared videos and pictures of her journey in the country under the hashtag #Run4Water. "We've received nothing but big warm smiles and bear sized hugs from everyone we've met here. Egypt and its people are beautiful," Guli wrote on her account. She is currently heading to Aswan for a run, and will then fly to London for a final run along the River Thames.